Discussion in 'Techniques / Training' started by Mason, Mar 15, 2018. You may already know this but remember... quality over quantity. Correct me if i'm wrong. But i always feel this strange mood from your plays. Seems like people are a bit maybe bored. Just walking on the court. No passion, no heat, no excitement. Not giving 100%. But maybe it just seems.. Shots from yesterday’s games, I need to get further behind the shuttle still ! Look back at some of the posts that I made. Actually I don't think that you progressed and reverted back to some old habits. Your defensive lift looks like you are pushing with your forearm instead of flicking with your wrist (both backhand and forehand). For backhand, check back your grip, your thumb should be on the flat side and the handle should not be 90 degrees perpendicular to your forearm (if it is, then you are gripping too strongly, relax). You are starting all your forearm strokes by lifting your forearm and flicking your wrist. Instead you should start and lift your elbow first. 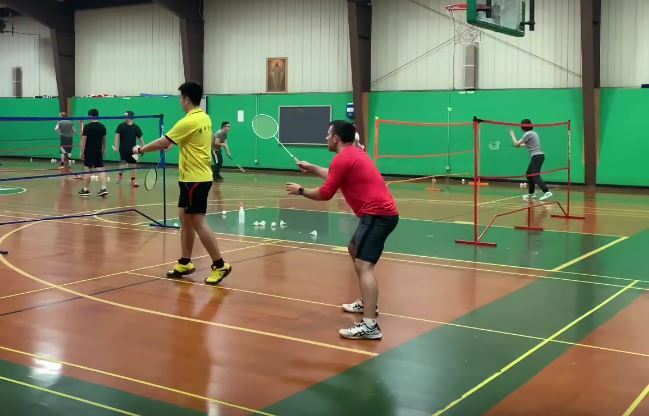 Take a wet towel and practice swinging it like a racket : you will feel that you can't just push your forearm and flick your wrist, you need to throw your elbow and your wrist will follow through naturally. it seems like you didnt apply the dry swing practice into the real match. It looks like you are using your whole arm generating power. Your stroke consumes too much energy because it isnt correct yet. You need to be smoother and relax. Keep practicing !!!! Right now I’m trying to work on specifically starting my stroke with a more “side on” position, while using the proper grip/pronation, then really only facing the net after I hit the shuttle. Mseeley has been helping me with that, which I really appreciate. It’s not translating much into games as I do not get much time to practice with a shuttle. Mostly shadow swings. Last night I literally had 3 minutes to practice so that didn’t help either. But I find that as I continue to work on one thing, other things take a back seat or even regress. Along with that I’m working on my footwork which I know has helped. I played singles in my last game against a player that normally beats me 21-11 and I was able to get 21-18. Here are my shots from last night. Once again I noticed that I wasn’t behind the shuttle enough on most of my smashes and drops. I was however able to play with the the second best player at this club for most of the night and he was able to give me some general pointers. Yes I’ve noticed as well my back hand drives and clears are not looking good. I think part of my issue is my grip is wrong. I’m gripping as if I’m doing a back hand net kill , and I’m guessing that is wrong ?? It looks weird because you didnt use supination. In your video when your back hand drives and clear seems like you pushing it with your arm. There are two type of backhand grip . First , the one that you put your thump on the grip. This one is use for net kill , drive, and hit shuttle when it is in front of you. The second one is called bevel grip. Your thump will be on the small edge on the grip. This one is use for backhand overhead, clear, or when the shuttle is not in front of you. I know a lot of people who dont use bevel grip when perform backhand clear, but they still can do it, and its hard to tell the difference whether they use the bevel or not. Also, I know a lot of people who only use bevel grip on all of their backhand play. So I dont think It is about the grip. Maybe if you are still stuck in how to perform the forehand play correctly, you could look and practice some backhand swing to understand the mechanic of how the kinetic chain work. Because without the correct kinetic transfer and proper form you could barely do backhand clear perfectly unless you use the shuttle that fly too fast. So it’s very clear that my backhand needs a lot of work. But after watching some of my games I noticed that perhaps on many of these shots that I chose to hit back hand , I could have made a better shot by hitting with a forehand grip. Am I right to conclude that many of these shots should have been hit as an around the head forehand shot? For some of them, you need to improve your firework footwork by now than one level, but ask them could have been played as forehand shots, yes. Overall, I'd say keep improving your forehand before paying too much attention to your backhand. s_mair and Mason like this. Everyone talks about the backhand here, but in doubles the backhand is not so important and you can do almost anything with the forehand (good footwork)... No question about it, a good backhand is also important, especially in the singles. But I would still start with the right grip for the forehand. On the picture it just looks strange and I noticed it quite often. Furthermore, the motion sequences do not look smooth. Often this is due to the wrong technique (wrong grip position) and if you are not relaxed enough. The younger man (boy) does exactly that and it just looks better by worlds.